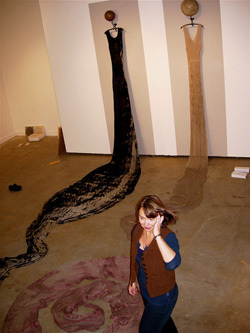 Carol Shaw-Sutton is a sculptor and installation artist specializing in fiber and textile processes. Shaw-Sutton has been exhibiting her work in museums in the United States and internationally since the 1970's including museum exhibitions in Switzerland, Germany, Italy, France, Japan and Canada, as well as New York, San Francisco and Los Angeles. Her work is included in major museum, corporate and private collections worldwide such as The Oakland Museum of Art, The San Francisco Museum of Fine Arts, The University of Lausanne, Switzerland, The Charles A. Wutsum Museum of Art, New York, The Mint Museum, North Carolina and Jean Lucrat Center for Tapestry, Switzerland. She is also the recipient of numerous awards, including two National Endowment of the Arts Individual Artist Fellowships, The Young American Award from the American Crafts Council, The United States / Japan Fellowship and The United States / France Fellowship at the La Napoule Foundation. She was also been awarded The Fine Art Award from the International Textile Biennale in Kyoto, Japan. Locally she has been awarded the Public Corporation for the Arts Fellowship from the City of Long Beach, CA and The Outstanding Professor Award from the California State University, Long Beach. Carol Shaw-Sutton has been a Professor of Art at California State University for 23 years and has been the Chairperson of the Fiber Program for15 of those years. She currently works and lives in Long Beach, California.